Editor’s note: This post wraps up Jan. 14-15. Looking for the latest updates? Find them here. 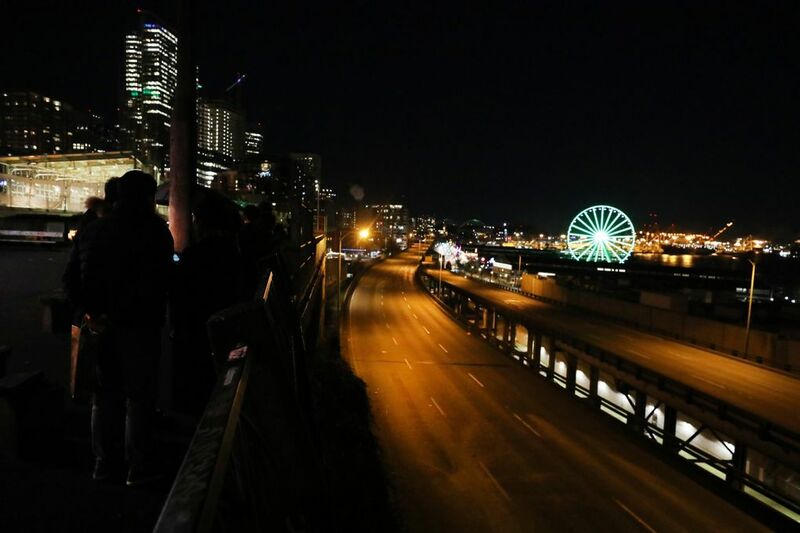 The Alaskan Way Viaduct closed permanently at 10 p.m. on Friday, beginning the longest highway closure in Seattle history. 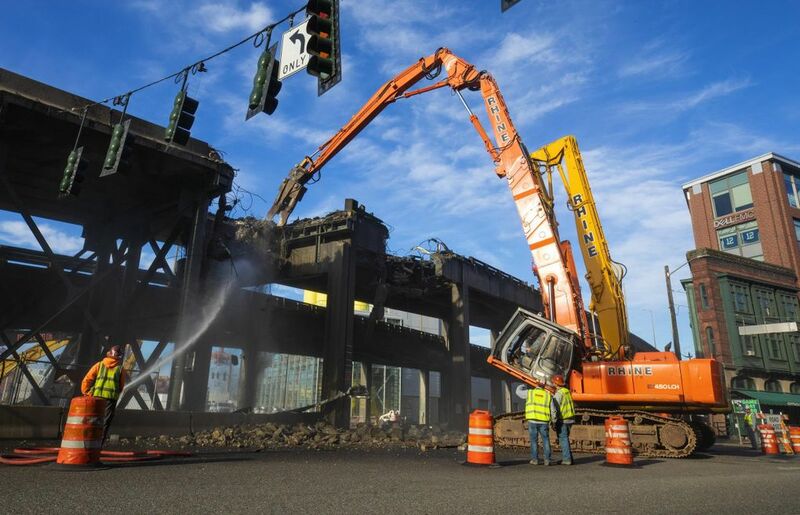 The viaduct’s 90,000 daily vehicle trips and 30,000 bus riders will be detoured, and the effects could ripple out from Sodo as far as Woodinville and Auburn. Here are resources to help you navigate the congestion. 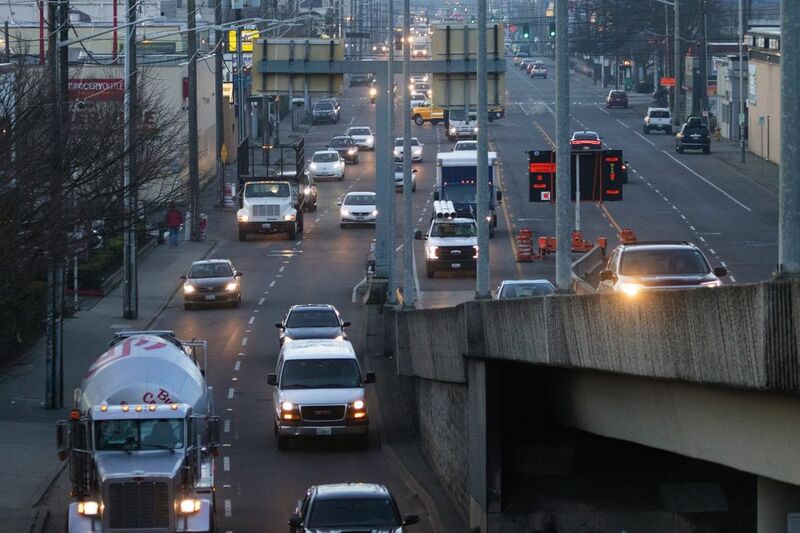 The new Highway 99 tunnel is expected to open sometime during the week of Feb. 4. 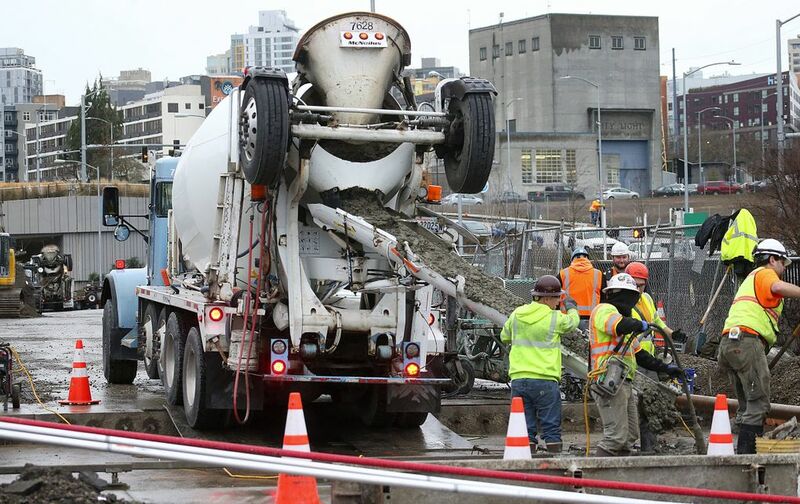 Contractors need these next three weeks to pave ramp connections from Aurora Avenue to the north tunnel portal, and from Highway 99 in Sodo to the south portal. Here’s what you can expect during the Highway 99 closure. 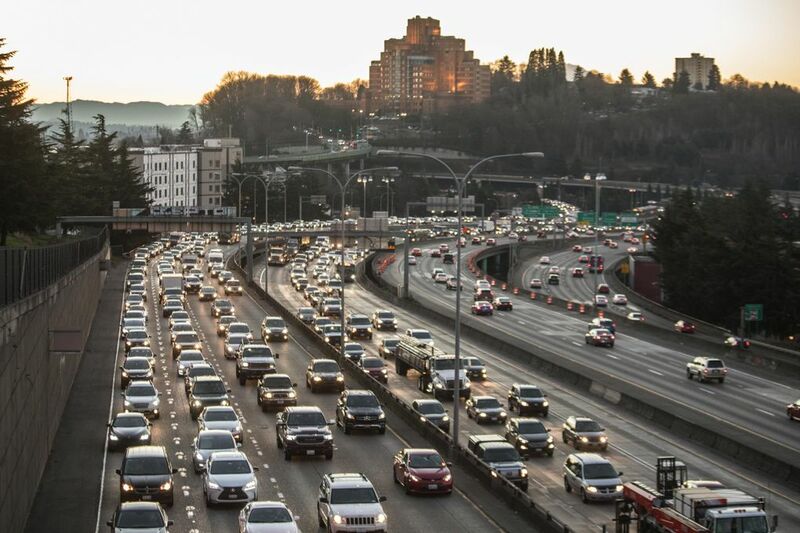 Despite some early backups on I-5 and I-405, traffic patterns remained mostly normal throughout the second evening commute of the week, according to the Washington State Department of Transportation (WSDOT). 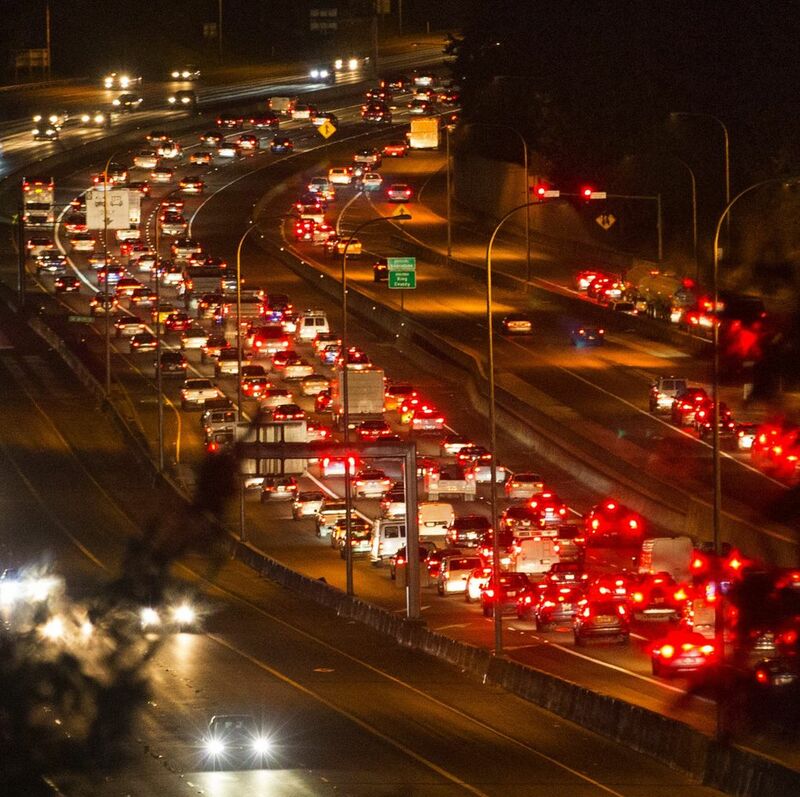 A collision around 6 p.m. caused a four-mile backup on northbound I-5 near Mountlake Terrace but was quickly cleared. Worsening weather will test commuters for the rest of the week. Rain and wind will return to the region Wednesday, according to the National Weather Service. 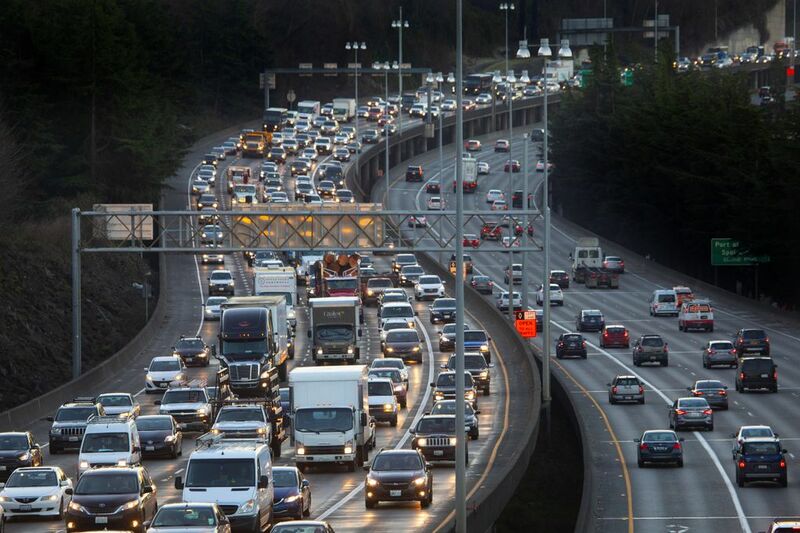 WSDOT urged commuters to give themselves as much extra time as possible. How was your commute? 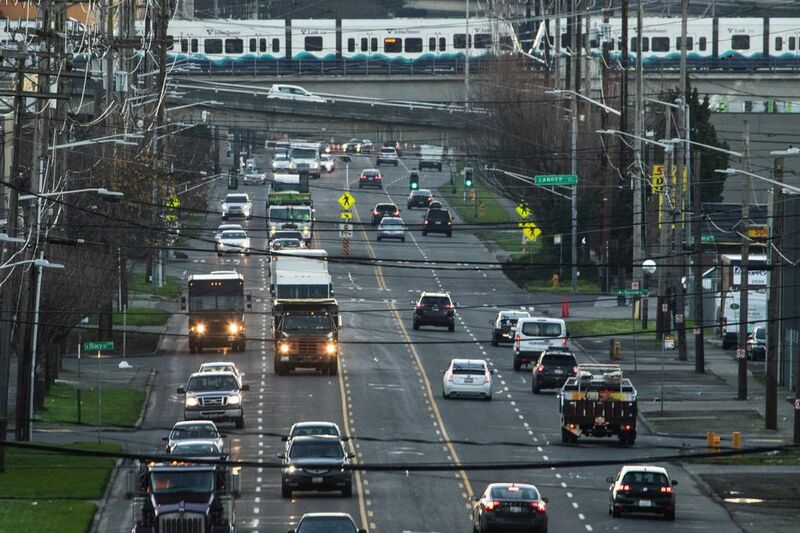 Tell us about it at trafficlab@seattletimes.com or by leaving us a message at 206-464-2003. How was your commute? Let us know. We'd like to hear how your commute went. Email us at trafficlab@seattletimes.com or leave us a voicemail message at 206-464-2003 to tell us. Crews have cleared a crash that caused a four-mile backup on northbound I-5 near Mountlake Terrace to the shoulder. The Washington State Department of Transportation expects the backup to clear quickly. A collision is blocking the two right lanes of northbound I-5 near State Route 104 at Mountlake Terrace. Expect delays. Unlike Tuesday morning, when several collisions slowed traffic, no major roadways are being blocked by crashes during the evening commute. Travel times are “holding steady,” according to the Washington State Department of Transportation. In an indication of some people opting against driving altogether, bike travel in several areas increased this week compared to previous years. 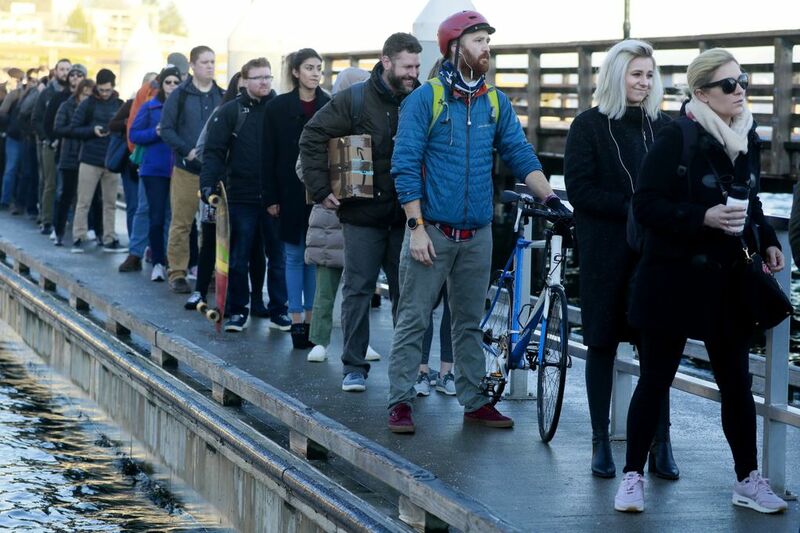 At the West Seattle Bridge around 5 p.m. Tuesday, the bike count was at 970, higher than the usual volume for mid January. Count is 970 at WS Bridge with a few hours left – again twice the usual bike volumes for mid January. 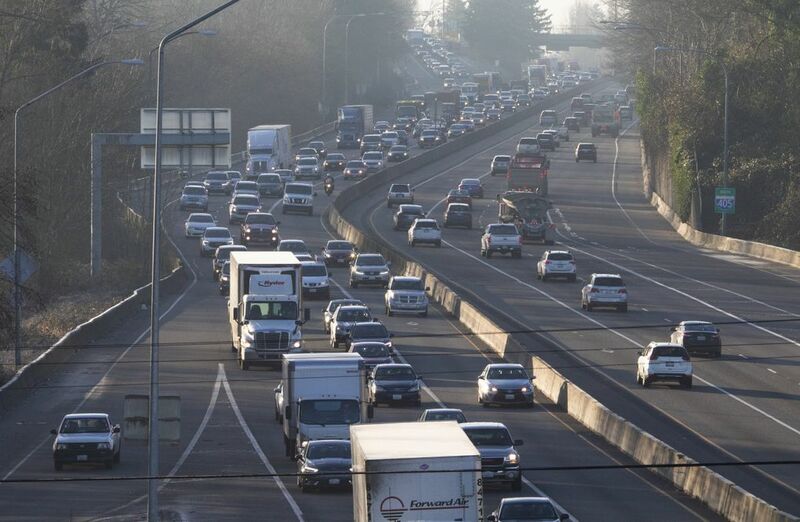 Though traffic remains heavy on southbound I-5 and I-405, the Tuesday afternoon commute is relatively normal so far, according to the Washington State Department of Transportation. King County Metro warned riders to expect delays on southbound I-5 from Northgate to I-90 and Southbound I-405 from Bellevue to Renton. Drivers are facing backups and stop-and-go traffic on southbound I-405 near Bellevue and Factoria. At Coal Creek Parkway, a collision blocked the right lane for about 15 minutes and has now been cleared. Traffic is stop and go on I-5 southbound through North Seattle, according to the Washington State Department of Transportation (WSDOT). Travel times from Lynnwood to Seattle are about 10 minutes longer than usual. Slowdowns in that area are normal, but “this kind of solid backup is new,” WSDOT wrote on Twitter. 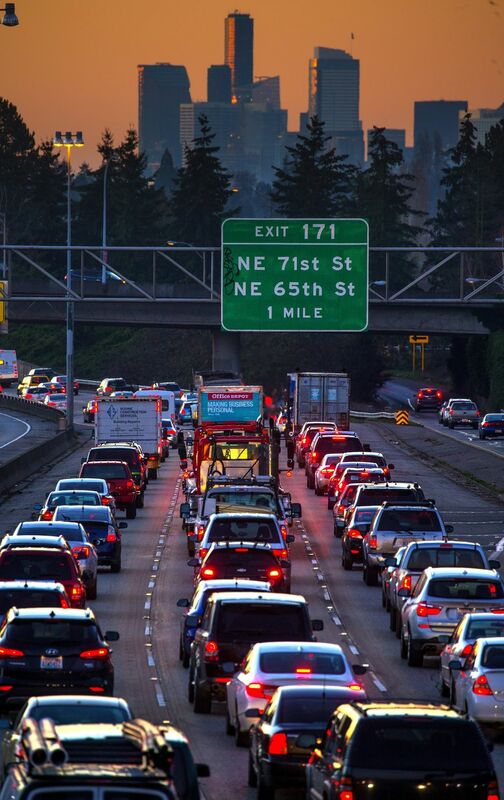 If you’re headed out soon, check travel times on WSDOT’s website before you go. 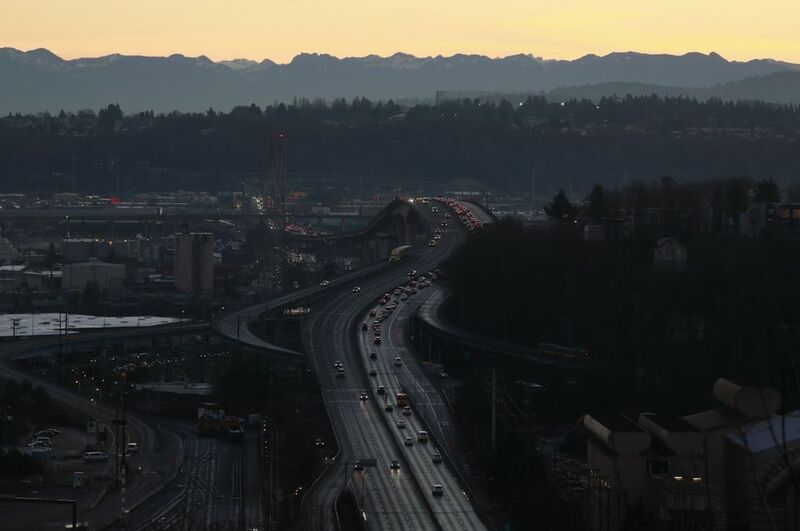 After a clogged morning commute, regional travel times are already showing slight delays for the afternoon especially on southbound I-5 through Seattle and southbound I-405 from Bellevue, according to the Washington State Department of Transportation. We’ll be posting live updates throughout the afternoon and evening commute. On Tuesday morning, a crash on southbound Interstate 5 snarled traffic on Mercer Street in South Lake Union, a notoriously congested throughput. 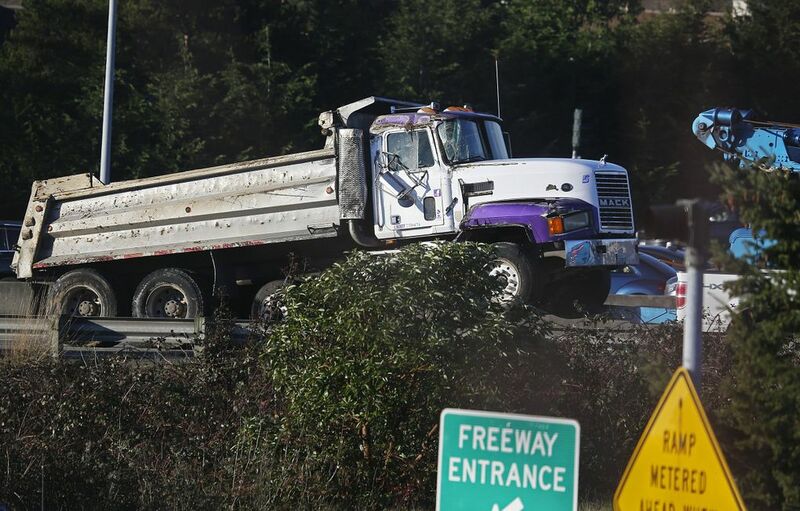 At least three incident response trucks from the Washington Department of Transportation entered southbound I-5 from Mercer after the crashing, creating delays while crews worked to remove the damaged vehicles. Further south, buses and cars moved steadily along Aurora Avenue despite its narrowed capacity. Seattle police directed traffic at the intersection of Highway 99 and Denny Way. Perhaps the quickest mode of travel was walking, if pedestrians were able to avoid slipping on slick sidewalks caused by low temperatures mixing with morning fog. JoJo Sun, who lives in South Lake Union and works as a software engineer near the ferry dock, commuted by foot to her job. She said her travel time has been about the same over the past two days and plans to continue this mode through the three-week closure. This concludes live updates from Tuesday morning’s commute. We’ll return in a few hours to provide updates from the evening commute. Travel times to and from Seattle have returned to their usual state. Crews have cleared the collision site on southbound Interstate 5. Traffic is moving along through Interstate 5 at Northgate, shortening the commute from Seattle to Lynnwood to 24 minutes. Meanwhile, near Georgetown, a collision is blocking the two right lanes of southbound I-5 and the off-ramp to South Albro Place. Three lanes are now open on northbound Interstate 5 at Northgate and two others should be open within the next 30 minutes, according to Washington State Patrol spokesman Rick Johnson. The travel time from Seattle to Lynnwood is now an hour. Seven Seattle Public Schools bus routes ran between 10 and 30 minutes late Tuesday morning, according to the school district. Two left lanes of northbound Interstate 5 have reopened at Northgate, but traffic is still backed up for nearly five miles. All lanes of northbound Interstate 5 are blocked at Northgate while crews work to clear a crash site after a dump truck rolled over. Traffic is backed up for four miles. Northbound traffic on Interstate 5 extends for about three miles, from Northgate to Northeast 50th Street. Commuters should expect long delays or find alternate routes, according to the state transportation department. The commute time from Seattle to Lynnwood, which is usually about 15 minutes, is currently 45 minutes. Traffic is backed up for more than a mile on northbound Interstate 5 south of Northgate because a truck rolled over, blocking the three right lanes. The driver of the truck wasn’t injured, according to the Seattle Fire Department. The crash is affecting northbound commutes from Seattle. Travel times to Lynnwood and Everett are about twice as long as usual. 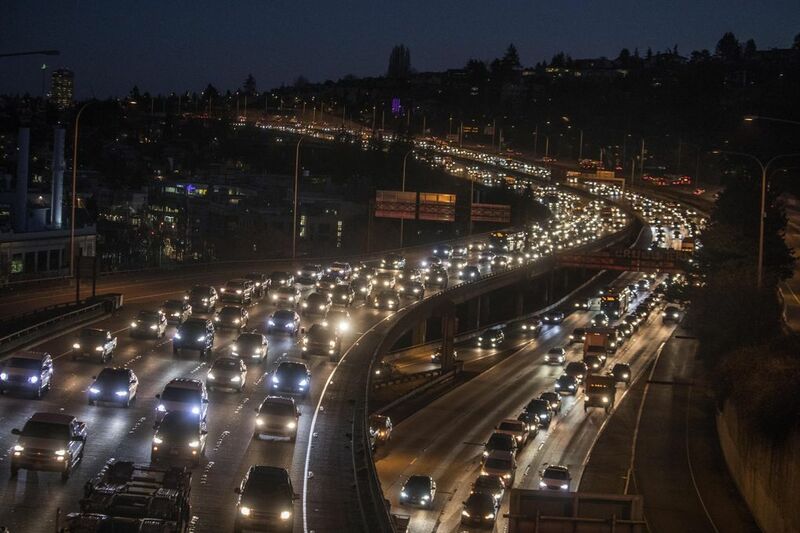 Traffic is heavy on both northbound and southbound Interstate 5 into Seattle. Southbound traffic is especially heavy from south of the Aurora Bridge to Denny Way, but light on northbound Highway 99. 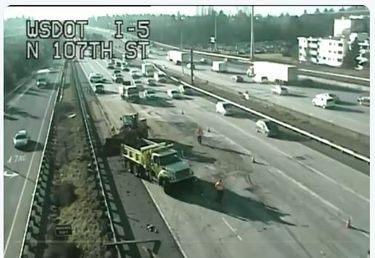 In Northgate, a truck that rolled over is blocking the three right lanes of northbound I-5. Commuters should expect significant delays. On Third Avenue and Pine Street, at one of downtown Seattle’s busiest bus transfer points, some commuters had changed their routines to adapt to the shutdown, but few were seeing big slowdowns. Many expected things to get worse as people’s initial preparations fade and old commuting habits creep back. Joe Huber left an hour earlier than usual to get from West Seattle to South Lake Union, taking Metro route 55 to route 40. Todd Wallen typically drives from Auburn to his job at F5 Networks in lower Queen Anne. But he’s (mostly) ditching the car for the three weeks of the Highway 99 shutdown, driving instead to the Angle Lake Park & Ride to catch Link light rail downtown and then Metro route 24. It takes about 20 minutes longer than driving. And traffic looked fine to him Tuesday morning. Travel times are holding steady throughout the Seattle area. The heaviest traffic is on northbound Interstate 5, according to the state Department of Transportation. Sid Gurram left about 15 minutes early to get from Bothell to Dexter Avenue in Seattle. 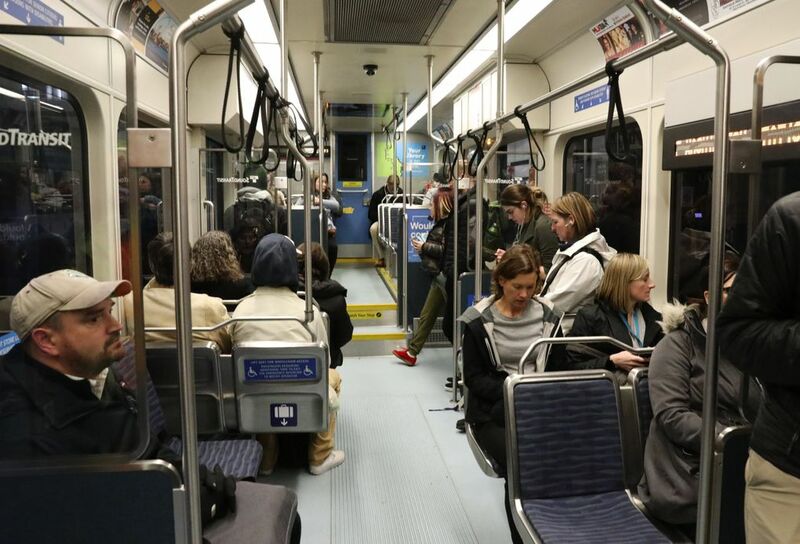 He takes the 435 and transfers to the 62 downtown. It took longer than normal and he'll be a little late to work. Drivers have reported slippery conditions on roads and sidewalks during their Tuesday morning commutes. The National Weather Service says isolated areas of freezing fog are possible, along with patchy black ice on bridges and some roadways. De-icing crews are out, not just on roads, but also in the bike lane of the low West Seattle Bridge, spreading salt where travel was slippery a day earlier. Two King County Metro buses collided on Alki Avenue Southwest, which will reduce capacity for commuters leaving the Alki and Admiral areas. Two lanes of Westlake Avenue North were briefly blocked by an aid response at Thomas Street in South Lake Union, which may disrupt streetcars, as well as the C Line and 40 bus schedules. King County Metro’s “Ride 2 Transit” service ran into technical problems that interrupted some service late Monday. The agency blamed the problem on a glut of customer requests. The public-private partnership, in which Hopelink drives people from their door to the water taxi or Alaska Junction, was back to normal by 5:30 a.m. Tuesday, spokesman Jeff Switzer said. Commuters set out early in West Seattle, filling all seats on the C Line and 55 buses by 6:10 a.m. — but those riders were treated to a 40 mph bus lane on Spokane Street and clear sailing through Sodo, to reach north downtown in 26 minutes, quicker than the normal Alaskan Way Viaduct route. Cars also were moving faster than 20 mph most of the way to Interstate 5. But the situation worsened quickly. Daily bus rider Colleen Harris reported her C Line bus skipped the last three stops just after 6:30 a.m. because it was too full. Water-taxi ridership is heavier than yesterday, West Seattle Blog reports, but no boats are near-full yet. 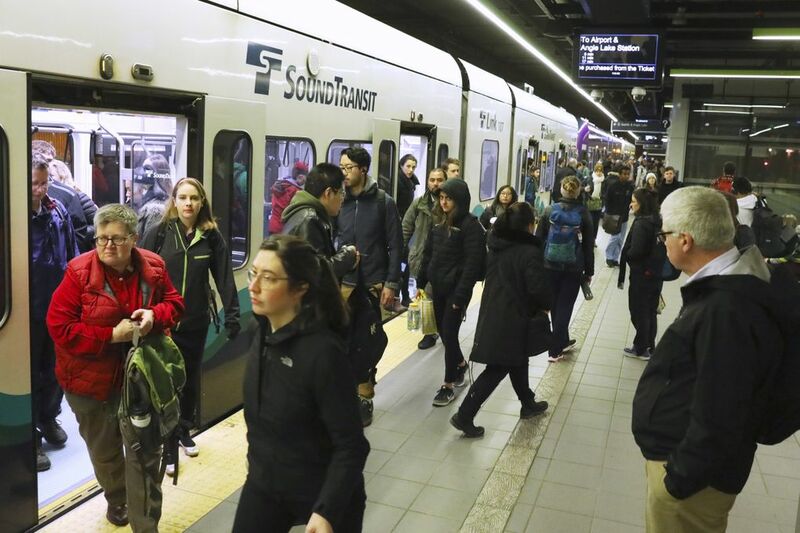 All northbound Sounder trains en route to Seattle are delayed up to 20 minutes because a tree fell on the tracks, according to Sound Transit. Travel times from south of Seattle into the city are longer than average, similar to Monday morning. The commutes from SeaTac, Renton and Federal Way are all at least 15 minutes longer than usual. Commutes within Seattle are also slightly longer. The drive from the West Seattle Junction to downtown Seattle via the West Seattle Bridge is about 25 minutes. We’ll be posting live updates Tuesday morning on the second day of rush-hour commutes following the closure of the Alaskan Way Viaduct. The National Weather Service has issued a dense fog advisory for much of the Puget Sound region through 9 a.m. Visibility will be limited during the morning commute. 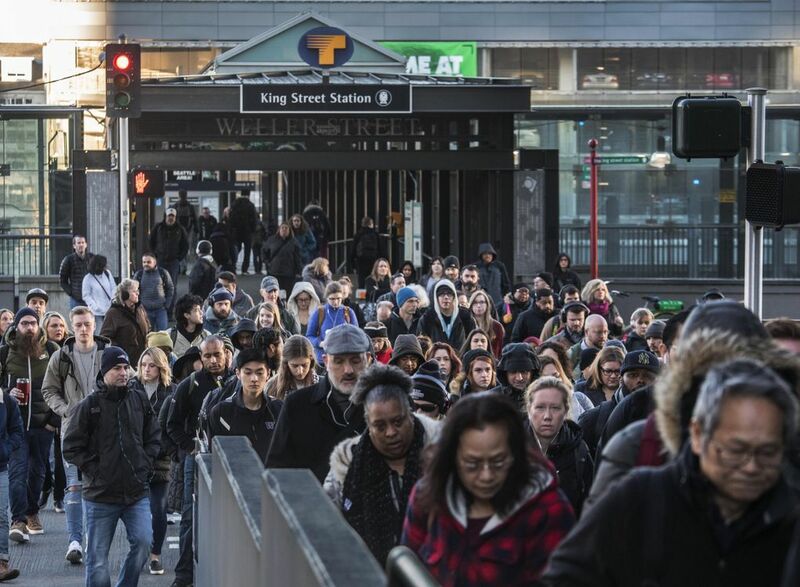 Evening rush hour remained relatively uneventful as Seattle finished its first business day since the permanent closure of the Alaskan Way Viaduct. As in the morning, commuters faced some delays but most were just 20 minutes longer than normal travel times or less. Most traffic incidents were minor or quickly cleared, though a collision on southbound I-5 near Tacoma snarled traffic for about an hour starting shortly before 5 p.m. Still, officials are warning the public not to return to their old ways later this week. 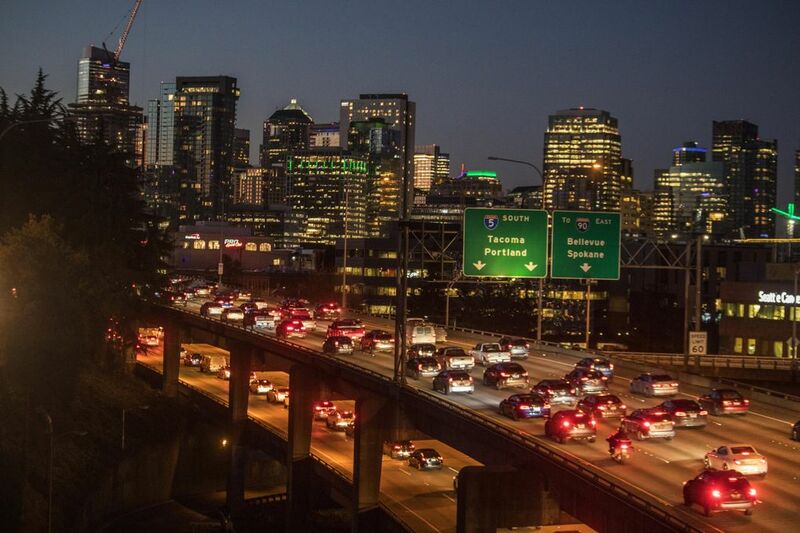 Tuesday through Thursday commutes typically have higher traffic volumes, according to the Washington State Department of Transportation. That could worsen traffic, especially if people who opted to take transit or work from home Monday return to driving later in the week. Travel times in Seattle and throughout the region remain mostly normal. Drivers are facing slight delays from Federal Way to Tacoma on I-5, Southcenter to Bellevue on I-405 and Federal Way to Bellevue on I-5 and I-405, though no routes are currently running more than 15 minutes longer than normal travel times, according to the Washington State Department of Transportation. For travelers taking the West Seattle Water Taxi, crews are allowing riders to tap their ORCA cards and prepay in order to expedite boarding. The water taxi, which is running an extra boat to allow sailings every 20 minutes, saw high demand Monday morning. 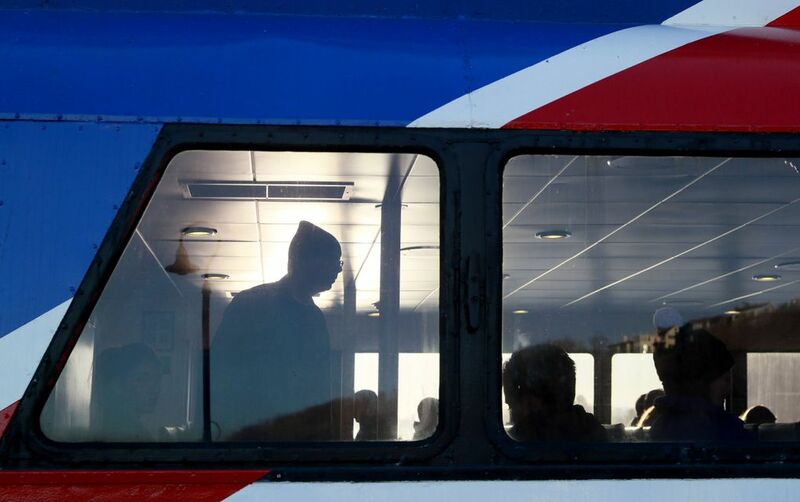 The boats carried 1,350 passengers compared to the usual 350. Traffic in Seattle is light but starting to pick up on eastbound Mercer Street, southbound I-5 and eastbound on the West Seattle Bridge, according to the Seattle Department of Transportation. 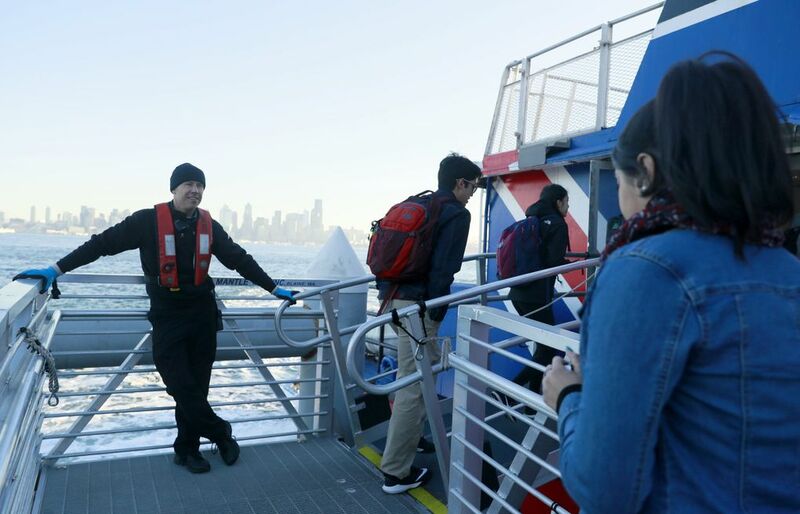 Washington State Ferries said its 3:50 p.m. sailing from Seattle to Bainbridge was emptier than usual, showing that commuters likely opted to bike, walk or work from home. Seattle Public Schools has added two more routes to its list of delays: Route 911 from the Experimental Education Unit (EEU) is running 40 minutes late. Route 651 from Thurgood Marshall is running 15 minutes late. Travel times from Federal Way to Seattle and Federal Way to Tacoma are about 10 minutes longer than usual, according to the Washington State Department of Transportation. A collision on southbound I-5 near Federal Way caused a two-mile backup, but it has now been cleared. After a mostly smooth morning, the afternoon commute will soon be underway. City engineers are monitoring hot spots for drivers leaving downtown and police will be stationed in areas where general traffic often crowds into the red bus lanes, delaying transit. Commutes are largely normal so far, with slight delays from Bellevue to Federal Way; Federal Way to Tacoma; and Lynnwood to Seattle, according to WSDOT. 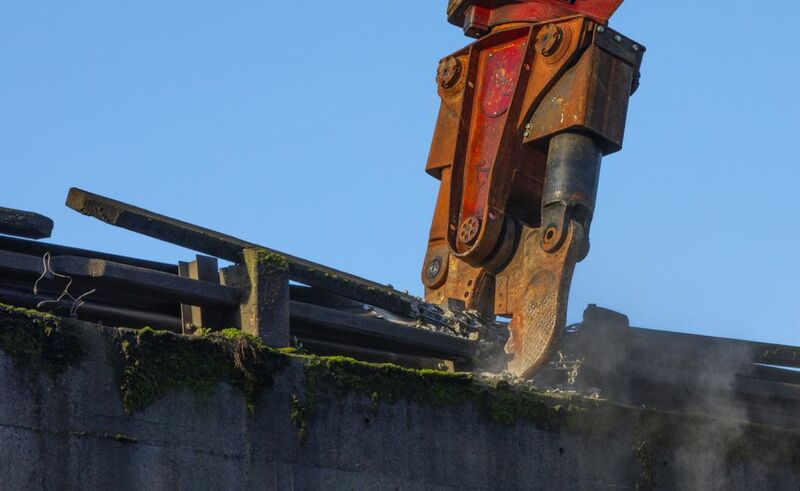 King County Metro warned of possible delays on southbound Interstate 5 from Northgate to Interstate 90. Several school bus routes are also slightly delayed, according to Seattle Public Schools. Route 149 from Northgate, Route 123 from Loyal Heights, Route 3 from Adams and Route 625 from Fairmount Park are each running 15 to 20 minutes late. About 16 Seattle Public Schools bus routes posted delays Monday morning, according to the district’s website. Most were under an hour late, an improvement compared to the delays that families experienced last fall at the height of a school-bus driver shortage. The routes most affected Monday morning — two hours late — were headed to Lawton Elementary School in Magnolia and Greenwood Elementary. To prevent service disruption, school-bus drivers are starting their shifts 30 minutes earlier during the closure, the district said in December. 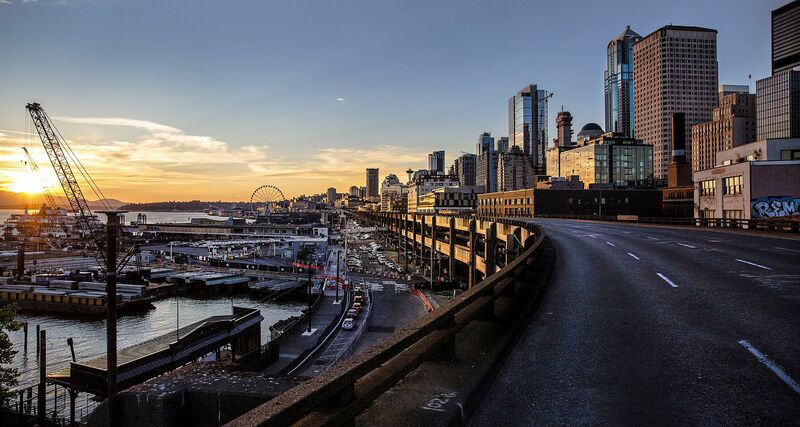 This concludes our updates from the first commute of the three-week period between the closure of the Alaskan Way Viaduct and the opening of the new Highway 99 replacement tunnel. All in all, traffic was a bit worse than normal, especially in suburbs and early in the commute period, but some areas enjoyed normal flows. We’ll provide updates during Monday’s evening commute and throughout the next three weeks. 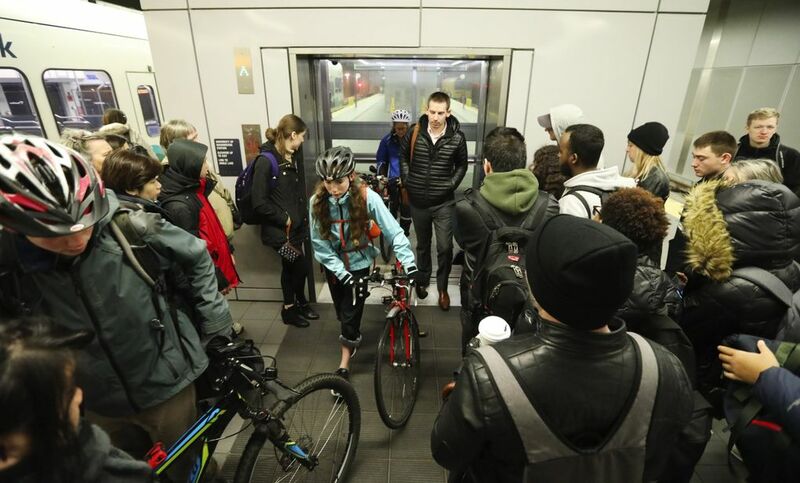 We’re also compiling experiences from commuters as they move throughout the Seattle. If you have a story you would like to share, please send it to trafficlab@seattletimes.com. Viaduct dread didn’t seem to make it to the Eastside Monday morning. 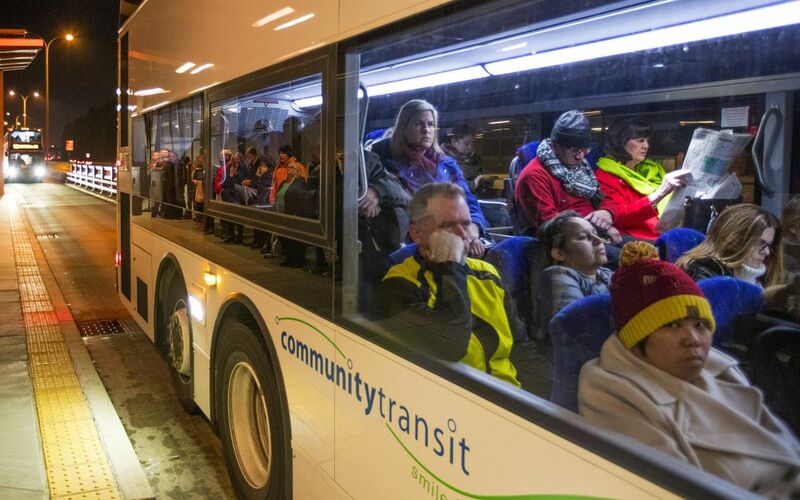 At Eastgate Park and Ride, bus commuters were blasé about the shutdown, expecting no impacts, in sharp contrast to the warnings from transportation planners about regional spillover effects. Commuters lined up. Buses came and went. If anything, volumes seemed lower than usual, with parking spots in Eastgate’s 1,614-car garage still available at 9 a.m. On an average day, the garage is 100 percent filled. Ashley Kern, who lives about two miles from Eastgate, was waiting for the 212 bus to downtown Seattle, where she works as a medical scribe, at 7 a.m., about 20 minutes earlier than normal. But even that minimal change in schedule was more than most commuters. It’s unlikely that any commuters — anywhere in the Seattle region — were as serene about the viaduct shutdown as Andrew Colson, who commutes from Issaquah to Bellevue, via Eastgate. Commute times within Seattle are better than normal, according to the Department of Transportation, while travel times on the Eastside are averaging about 10 minutes longer than usual. This may be a welcome update, but it doesn’t mean commutes won’t worsen later. Typically, travelers prepare for day one, and then trips get tougher midweek. On the E Line, an unusually large crowd of people gathered at the 46th Street and Aurora Avenue bus stop, waiting around 8:45 a.m. But the commute turned out to be remarkably easy. Three E Line buses showed up at the stop at the same time. The result was a bus that was the usual level of very crowded. 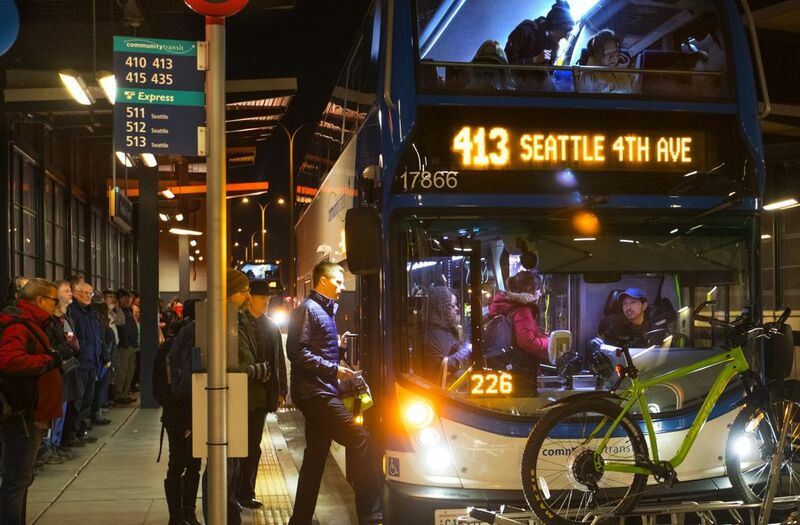 The ride to the Denny Way stop also went smoothly, with no long waits in traffic. Most freeway commutes have subsided to average delays, after taking twice the normal time a few hours earlier. The King County Water Taxi has been increased to transport nearly 900 passengers per hour, but most of the boats were less than full. “We’re telling folks, if you miss a vessel, you can see the next vessel,” said Metro spokesman Brent Champaco, standing dockside as lines of 150 or more people formed. Morale in the lineup seemed high despite freezing temperatures. Vivian Diaz said she normally takes the boat during summers but tried on Monday. “I think it will go great. It’s very efficient,” she said. Her problem was the 18-block uphill walk on the downtown side, she said. At 8 a.m., commute times on Interstate 5 and Interstate 405 are 15 minutes above average, at the most. The highest above-average commutes are Southcenter to Alderwood (67 minutes) and Southcenter to Bellevue (51 minutes). Fog has developed throughout the Seattle area, according to the National Weather Service. Drivers should turn on low-beam lights and drive slowly, the weather service advises. Water taxis are filling up fast. Some commuters are changing at the last minute from a clogged drive to parking and then taking the water taxi. Commute times from south of Seattle continue to be much longer than usual. The drive from SeaTac to Seattle is 42 minutes, which is 15 minutes longer than the average travel time. Seattle firefighters are responding to reports of a one-vehicle rollover crash on West Marginal Way Southwest near Terminal 107 Park. Commuters should expect additional traffic delays on the roadway. The commute from the West Seattle Junction to downtown Seattle on the West Seattle Bridge — a six-mile route — is about 35 minutes. 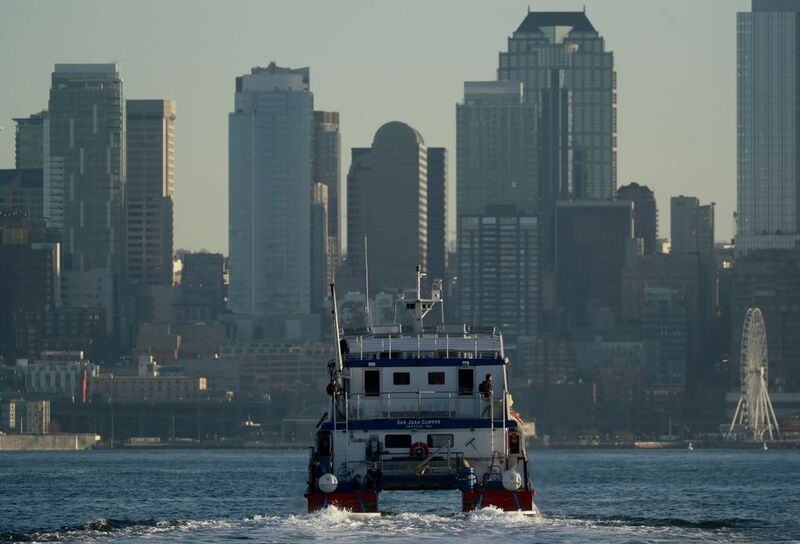 King County Water Taxi has added the 245-passenger San Juan Clipper on its West Seattle-to-downtown route, to join the 278-passenger Doc Maynard. Basic fare is $5 each way with an adult ORCA card. Boats depart Seacrest Dock next to Marination Ma Kai restaurant, and arrive downtown next to the state ferry terminal. Meanwhile, Seattle Mayor Jenny Durkan is at the Seattle Department of Transportation’s operations center. King County Metro runs an on-demand shuttle service on the Eastside, called Ride2, that deposits transit riders at the Eastgate Park and Ride. Steven, a Ride2 driver, said he normally has a lull at the beginning of his 6 a.m. shift, before riders start calling. But not today. “People started calling earlier,” he said, and his own drive in from Auburn had more traffic, too. 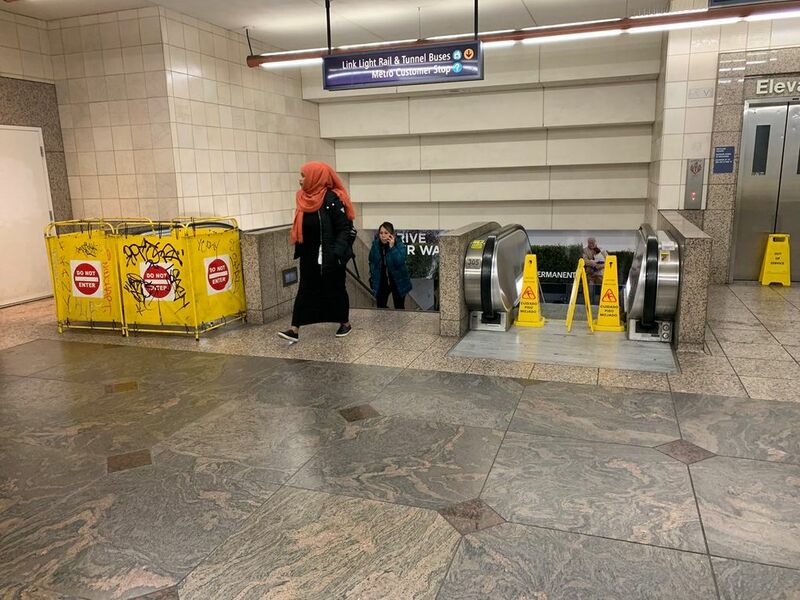 At the Westlake station in downtown Seattle, three of four escalators and an elevator are out of service at Third Avenue and Pike Street. 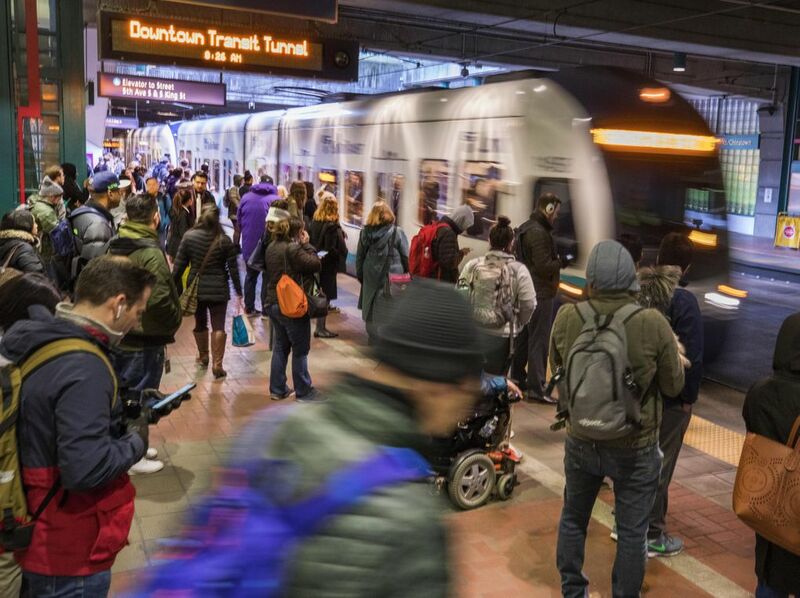 Travel times from south of Seattle into the city are already about twice as long as usual, according to the Washington state Department of Transportation. The commute from Federal Way is 61 minutes, from SeaTac 38 minutes and from Renton 39 minutes. We’ll be posting live updates during the first regular commuting day since the Alaskan Way Viaduct was permanently shut down. 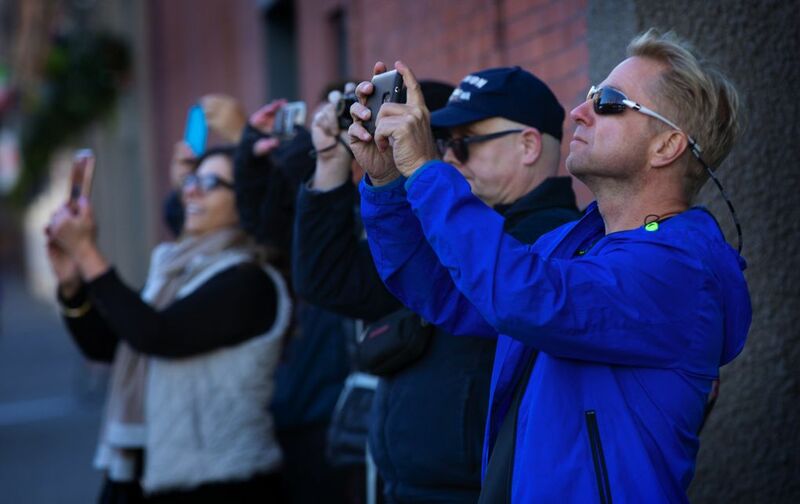 Seattle Times journalists will provide coverage from various spots in the city. 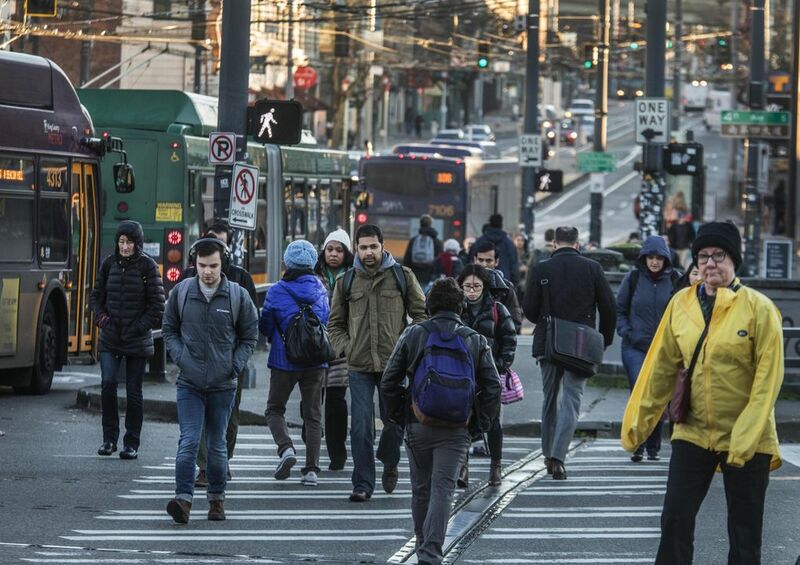 We’re compiling experiences from commuters as they move throughout Seattle. 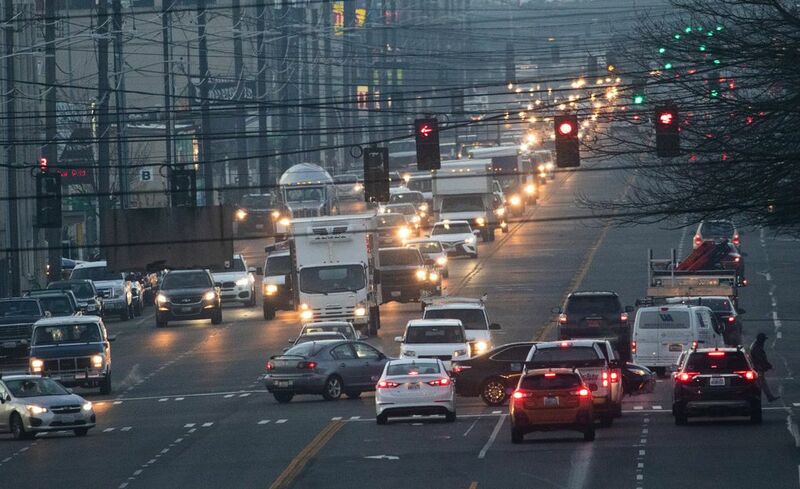 Share the story of your commute today by sending an email to trafficlab@seattletimes.com, or by leaving us a voicemail message at 206-464-2003. But please don’t call or text while you’re driving. Washington law forbids almost all use of handheld devices while behind the wheel. Wait until you reach your destination.